In Ena Valley,where spectacular winter scenes can be observed,you can see special performances during the Lunar New Year holidays. Food,drink,and souvenir shops will line the venue so that visitors can enjoy an atmosphere like that of a Japanese festival days. 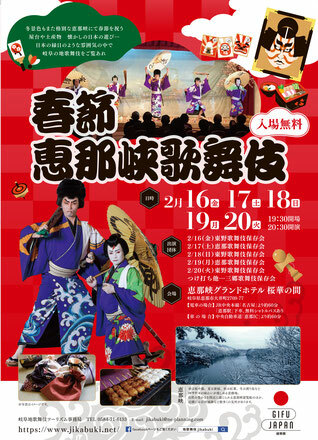 This is a special performance where the most popular plays of Ji-Kabuki are presented, and audiences members can experience ohineri-throwing and call-outs. 10min by car from Chuo Expressway Ena IC.